Various forms of casino poker exist, where players build hands to play against the dealer. 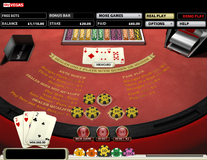 Players play their hands in turn, then the dealer makes a hand to see if they can beat each player (similar to Blackjack). Players pay an ante at the start of the hand, and then contribute more money to stay in the hand/play. For some forms of Poker this may involve taking more cards/swapping cards. After a deal players have the option to ‘fold’ their hands, which means forfeiting the original stake, and losing the hand. Poker antes, and money paid to stay in the hand/play are paid out at even money to winning players at the end of the hand. Many forms of Poker have side games, which give greater odds than even money. These pay out if players make more impressive hands. 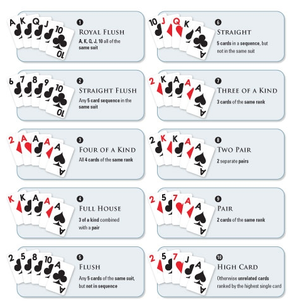 Standard poker hands are applied, see image 1 and 2 for an overview of these for 5 card and 3 card poker. 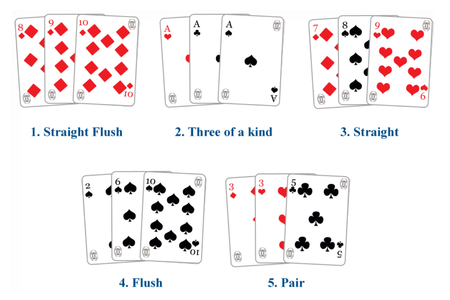 Note in 3 card the straight is a better hand than the flush, in 5 card the opposite applies. Hands that are harder to build/less likely to be dealt, are worth more than more common hands. The better hand wins, while some casino poker bets pay out on good hands, regardless of whether the dealer’s hand is stronger. Pair Plus/AA Bet: A bet staked before a hand on the side game. This game pays bonuses for good hands (pairs and better) and pays out regardless of whether player beats the dealer’s hand. Call/Play Bet: A bet staked after cards are dealt to stay in a hand and see more cards/finish the hand. This has to be the same size bet as the ante. Fold: Handing cards back after cards are dealt, without calling/playing the end of the hand. Folding loses the hand and results in a loss of the ante. Dealer Cards: Cards dealt to the dealer at the end of the game to determine winning hands. Pushed Bets: Any bets that go uncontested. These bet stakes are returned to the player. *Note it is possible on one hand to win ante’s and call/play bets, but lose pair plus/aa bets and vice versa. Image 1 shows the layout board for Three Card Poker. Players bet an ante before hands are dealt. After hands are dealt players either fold and forfeit the ante, or double the ante by betting on the play bet. This bet has to be the same as otherwise players would be able to put more money on stringer hands, and less on weaker hands. The ante is staked before cards are dealt and determines what the total stake will be on playing a hand. The Pair Plus game is a separate game, which players can opt to play or not. Pair plus bets are lost if the player fails to make a pair or better. Playing on Pair Plus means bigger payouts for better hands, and is a guaranteed payout regardless of the dealer hand. This protects the player against having a good hand being beaten by a very good dealer hand. After ante’s and pair plus bets are placed each player is dealt their three card hand. 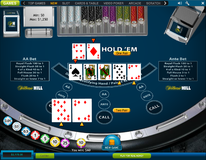 At this point the player must decide whether to double their ante and stake on the play bet or fold. The play bet must always be the same as the ante bet. This rule exists to stop players putting more money to play out good hands, and less to play out weak hands. Once cards are dealt the pair plus bet is decided, although the bet won’t be shown, and consequently won or lost until the end of the hand. In image 2 the player has 2, 3, 9 unsuited so high card 9. This will go on to lose the pair plus bet. The player has to decide whether to play the hand, or fold the ante. The 2, 3, 9 (dealt in image 2) is a weak hand which will lose on pair plus (if it was staked). The player can fold the hand to lose the ante too as shown in image 3. Alternatively the player could try to beat the dealer to win their ante bet by betting on the play bet. As the hand is below Q High the only way the player will win the bet is if the dealer has no hand and has to fold. If the player plays and the dealer has a hand they will lose ante and play bets (as well as pair plus already being lost if staked). Any hand no matter how poor can win an ante bet, provided the dealer does not make a hand. Image 4 shows a player playing on a 10 High, and hoping the dealer doesn’t make a hand so they can win on their ante bet. In this case the dealer has J High, which is better than the players 10 High, but is not a Q high or better so counts as the dealer not making a hand. The dealer pays up on the ante bet, and the play bet pushes (is given back to the player). The play bet is only payed up if the dealer makes a hand and which the player beats. This turns a bet, which would have lost by being folded into one that win. Had the dealer had a Q High or better the loss by playing would be double than that by folding. Image 5 shows a player playing a Q High (7, J, Q unsuited). The play bet on this is hopeful the dealer does not have a hand as this is only just better than the worse hand the dealer plays on. The dealer shows a pair, which is a better hand than the players Q high, so both ante and play bets are lost. Players who play pair plus bets may be particularly tempted to play on high card hands. This is because playing on high card hands can win the ante bet, to cover the loss made on paying pair plus for that hand. In the hand shown in image 6 the player has a pair of 2’s. This will beat any high card hand, but lose to higher pairs or better. If the player staked on pair plus this will pay out at 1/1 (even money). 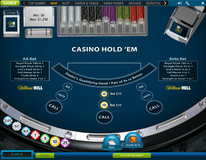 The player will normally play on any pair or better, as the dealer has a less than 50% chance of getting a pair, whereas bets are paid at even money. If the player bet on pair plus (normally placed at the same stake), their winnings and stake return from this winning bet will cover the loss on ante and play anyway so the worst the player can do is break even on the overall hand. Image 6 shows the pair of 2’s from image 5 beating Ace High. In this case the ante and the play bet both pay out. Had the dealer drawn a hand worse than Q high the ante would pay but the play bet would push. In cases when players have good hands they want the dealer to make a hand, for them to beat on the play bet. Had the dealer had a hand stronger than a pair of 2’s the ante and play would lose, but the pair plus would have paid meaning a net loss on the hand. Three of a kind is the second best hand in three card poker, behind a straight flush. In image 7 the player played on K High, meaning the hand lost to the dealer. In this case ante and play bets lose. Pair plus would also lose, were it staked. Flushes, straights, and three of a kind pay out significantly higher on pair plus, than the ante bonus. If pair plus is not staked, these hands may simple win the ante bet, if the dealer fails to make a hand. Staking pair plus means a high profit will be paid, regardless of the dealer’s hand. In image 8 we see the pair plus on the player flush pays out, giving odds of 4/1. The £10 staked returns £50. The dealer also has a flush with king high, however as 10 is the second card this beats the dealer’s flush which has 9 as the second card. In this instance pair plus means the hand is profitable as the profit covers the loss of ante and play bets. If pair plus was not staked the bets staked would all have lost, despite the player having a flush. Pair plus protects against the dealer hitting a very strong hand. When the player hand beats the dealer hand, with the dealer hand being Q high or better, then all bets staked win. Image 10 shows a player straight beating a dealer flush. The play bet pays off, as the player hand beat a dealers hand. The ante bet pays off 2/1 as there is an ante bonus for flushes and better. And the pair plus pays up at 6/1 as per pair plus rules. The total win is £120 off a total stake of £30. The final £10 staked on play was only risked once the player realised they were holding a strong hand. 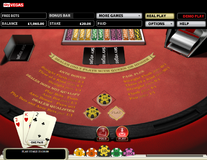 Image 1 shows the Casino Hold’em Table. 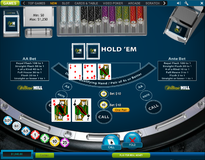 Similarly to three card poker there is an ante bet that is placed before receiving cards, and a call bet that needs to be matched to see the end of the hand (this is the same as the play bet on three card poker). There is also an AA bet which is equivalent to Pair Plus. This plays out greater on less common hands than the Ante bet. Payouts are shown on the left and right boxes of the table. To receive cards and play the player must place the Ante bet. The AA bet can be played or left un-played. In image 2 both bets are played. 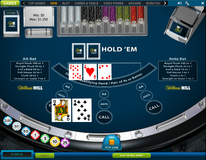 Casino Hold’em is based on the Texas Hold’em format of poker where players receive two cards, and add them to the five community cards to make their best available five card hand. The call bet is added after seeing the flop of the first three cards. This means (unlike three card poker) the player makes a call on the hand they may go on to make. After a player calls then the last two cards (turn and river) are shown together. If players have four cards from a straight or flush they may be tempted to call, even though their hand as it stands is just a High card, effectively betting on their cards to come. Similarly if players have a pair the final two cards could turn into three of a kind, or two pairs. In image 3 an example is shown of a hand that may be folded after the flop. The player paid for ante and AA bets, however after 3 cards are shown the player has high card and no draws (straight or flush chances). Obviously after folding the last two cards could be for example two queens which would have given the player 3 of a kind, however the player may fold deeming this unlikely. In image 4 the hand shown is stronger for the player, with the players Jack pairing up with a Jack on the flop. The Jack is the highest card on the flop so with top pair, the player has a good chance of beating the dealer so will call. Image 5 shows the hand in image 4 having played out. The player ended up two pairs as after the turn and river a pair of 3’s was left on the board too. The hand is two Jack’s, two 3’s and the Ace also on the board. The dealer’s two cards failed to improve the hand in the middle so the dealer plays on a pair of 3’s. To make a hand the dealer needs a pair of 4’s or better. This is a better hand than the Q High needed in three card poker, as with 5 cards pairs are easier to make. As the dealer makes no hand the call bet doesn’t pay out, only the ante. So the return on £10 stakes is £40. 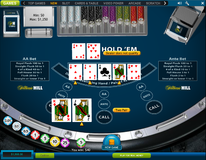 Image 6 shows another hand where the player calls and goes on to make two pairs. On this occasion the dealer makes a pair of aces to count as a hand. As a result the return on £10 stakes is £60, as the call bet is a winner. As with three card poker the player calling on a weak hand may hope the dealer fails to make a hand, however the player calling on a strong hand will hope the dealer makes a hand to beat for a great ante and call payout. Image 8 shows the player hitting a flush. In this case the player had 4 spades after the flop, and called the bet hoping for a spade in the last two cards. The dealer made one pair which was easily beaten. A full house is made of a 3 of a kind, and a pair. This beats both the straight and flush. In image 9 the player is dealt a full house on the flop, so without needing to use the last two cards. Obviously the player could use these, if for example a 4th Queen was shown. The player obviously calls, knowing the dealer is very unlikely to win. The hand shown in image 9 was a full house, one of the best hands in the game. This paid out on the AA bet at odds of 30/1. Had the player not played the AA bet then the bet would simply have paid out the Ante bet at 3/1 and the call bet at even money. On this occasion the AA bet would be good to play on (as in image 10), however on runs of not making big hands players can lose repeatedly on the AA bet. Very clear and well explained, great content!